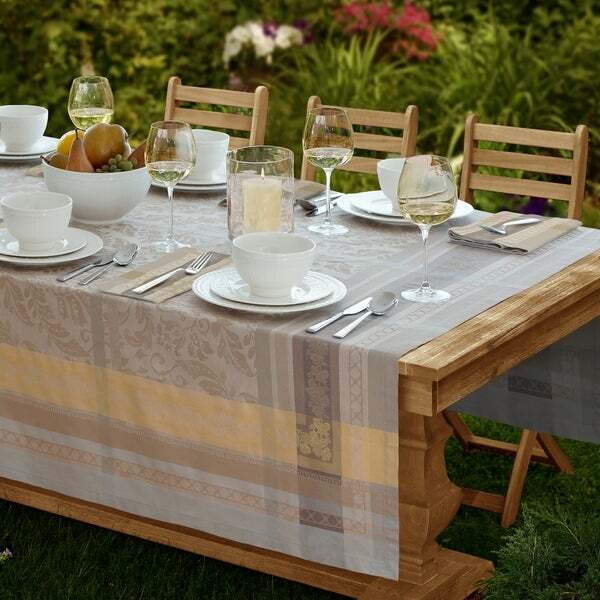 Let Villeroy and Boch stain resistant table linens transform your home into a French countryside cottage with this floral pattern, bordered by delicate hues of yellow, tans, grays, and naturals. With such lovely jacquard damask details and in European oversized luxury, Villeroy and Boch French Garden Promenade is sure to delight. Made with fine cotton, these linens are machine washable. Iron as needed. Use for everyday, dinner parties, holidays, celebrations, fine or casual dining. The rich and luxurious fabric will give your table setting the look and feel of a fine hotel or restaurant quality dining experience.